I’ve just landed in LA after a good 5 days in Minneapolis for EYEO Festival. No posts for a while… I’ve been super-busy with proposal and grant writing, and also flew up to Newcastle, in New South Wales, to check out This Is Not Art. TiNA, as it’s more affectionately referred to, is a festival of emerging and experimental arts, across writing, electronic art, theatre, and sound making. It’s an umbrella festival, headed by a local arts-hub in ‘Newy’ called OCTOPOD. Encompassed within TiNA is Electrofringe, Crack Theatre Festival, Sound Summit, Critical Animals, and the National Young Writers Festival. The prefix ‘re-‘ holds a mighty standing in the modern times. With every email it comes as an abbreviation for reply, while ‘re-‘ placed in front of many words supposes a return, or a repetition. In fact one can struggle somewhat to define ‘re-‘ without relying on ‘re-‘ itself. In many instances ‘re-‘ is an expression of applied will; a conscious act. This act is replete throughout the history of the arts. Artists from all times continue to explore what at best appears to be the thorough investigation of Re. Artists re-map, re-configure, re-purpose, re-mix, re-act, re-define, re-constitute and re-play. And play is a crucial word here. As the video game industry has boomed in recent years, games themselves have now come under close scrutiny of the academic eye. Artists continue to use game elements in their work. But while the games medium seeks to demand respect as itself a ‘fine art’, much philosophy is bubbling up around the idea of play, it’s importance not only in games; play is increasingly being recognised as a core facet in everyday human life. The exploration of the so-called ‘art-games’ have been afforded little inspection over recent years – perhaps the closest to the mark is Ian Bogost’s Persuasive Games (MIT Press, 2007) – but here, in Mary Flanagan‘s new book Critical Play, this close magnification on how play has shaped and influenced art for years finally comes to bear. Some great reviews for the Feeding the Transmitter compilation are floating about on the web…Really nice to see the release get a review on Neural too! I love that site and magazine… ! The 2nd half of the evening took place in a larger room adjacent to the cell-block, leading audience members past a ‘garden’ installation involving reflective surfaces and multiple light projections, by Erin O’Callaghan. I should also mentioned Dean O’Callaghan and his The Good Brew Co. services on the bar that night, providing the audience with an environmentally friendly ‘carbon-balanced’ beverage via local brewery Buckley’s Beers. This certainly added a welcome, refreshing community feel to the bar for the evening and an alternative to the usual Coopers/Wine selection. The first event to kick off the LA season for 2008 said it best with the site: the grimey, entropy-laden cells and halls of the Old Melbourne Gaol’s City WatchHouse. Hosted by students from the RMIT Fine Art Sound Department, and members of the ‘Within Earshot’ collective, the night began with a series of installations and ‘in-cell’ performances located along the main hallway of the Gaol. By and large I spent little time at the conference of this festival. It was just too much to do the conference, see films, exhibitions, and then manage to see all the acts of the night concerts without feeling completely exhausted. So I tended to skip the conference and come in for the night-time. I would have liked to see Jeffrey Shaw’s talk, hopefully there’ll be a podcast online. I managed to pick up quite a few items along the way: the Touch records 25th compilation, a bunch of free Gonzo mag cd’s, last years Sonic Acts publication, poster, and double DVD of video and computer art (@ 5 Euro it was a score), also picked up this years Sonic Axe text, filled with lots of cool interviews and such. Also found Autechre and Amon Tobin posters along the way. So I’ve come away with quite a bit. Tonight I saw a fantastic film by Mika Taanila called “The Future Is Not What It Used To Be”, (2002). The film documents the life of an ‘unsung pioneer’ of electronic art, Erkki Kurenniemi. His idea’s, illuminating thoughts and projects are vast, and the film gives you a direct insight into the mind and work of a great scientist, artist, instrument builder and archiver. This guy should make any collector or archiver feel sane. Kurenniemi was way ahead of his time, anyone interested in electronic art should check this film out ~ brings to light an individual whose work should stand alongside Cage, Moog, Stockhausen and Brakhage. 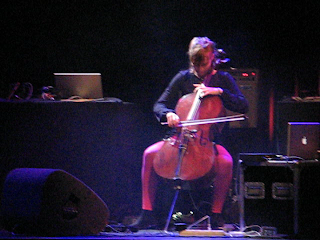 (BJ nilsen, Joachim Nordwall, Mika Vainino, Hildur Gudnadottir, Spencer Yeh, Carl Michael von Hausswolff).